Since 2011, we have organized several Digital Humanities (DH)-related panels at the annual College Language Association (CLA) conventions. Our primary reason? We want to raise the visibility of DH conversations in predominantly black academic settings. While the field of DH has moved forward in exciting ways over the past decade, African American scholars have largely been excluded from critical conversations. 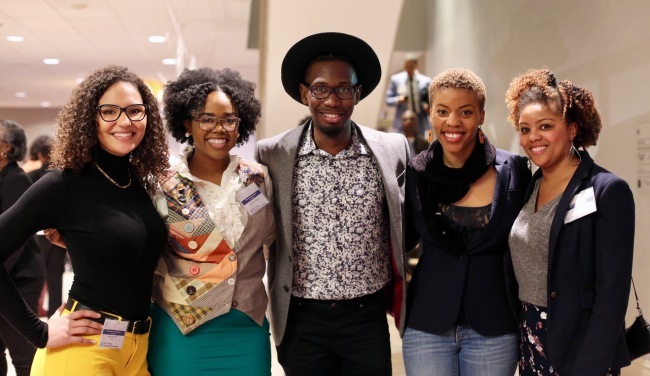 For our annual contribution to conversations about DH at CLA, we organized the panel “Mapping the History of African American Literature”—a panel that consisted of all black women doing work in DH. The panelists discussed their ongoing work using quantitative and qualitative data to explore various components of African American literature. The panelists discussed the value of using data driven techniques to analyze various aspects of African American literature. In the future, we hope to showcase the work of the panelists in order to show how black scholars, particularly black women, are engaging in digital humanities projects. Rae’Jean Spears is a first-year graduate student at Southern Illinois university Edwardsville, where she Studies African American literature. She is a graduate of Tougaloo College. Her presentation focused on a dataset project that she and Howard Rambsy II worked on concerning African American poetry and anthologies. Dr. Jacinta R. Saffold is a Mellon ACLS Public Fellow at the Association of American Colleges and Universities where she serves as the Associate Director for Diversity, Equity, and Student Success. Jacinta discussed how digital tools help answer difficult questions in African American popular street fiction at the turn of the twenty-first century. Jade Harrison is a first year graduate student at the University of Texas at Arlington. Her research interests include data analytics and African American women’s short fiction. Her presentation focused on findings from a year long SEED grant called “The Black Anthology Project,” created by Kenton Rambsy. Dr. Tyechia L. Thompson is a lecturer at Howard University and an AADHUM Scholar at the University of Maryland College Park. Her research areas are 20th and 21st Century African American literary and cultural studies and digital humanities. Her talk today addressed her ongoing revision of “Baldwin’s Paris” with attention to user-interface design.